The IBPS exam will now be conducted online from proceeding from the current year. The new change of this pattern will be seen into action from IBPS clerk Exam 2013 which will be further for specialist officer, RRB AND PO recruitment will now be Internet based examination. So, don't get yourself confused check here all the details of this whole new pattern of Online IBPS exam. 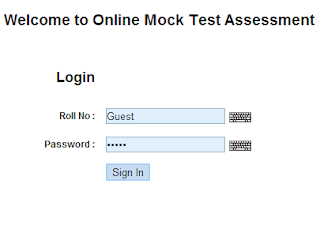 In this section we will show you some screen shorts from web app showing a design of online mock test with objective questions presented over here. * Firstly you need to login online exam by using login id and password. * Read and follow the guidelines given in window and then click on the box showing I'm ready. 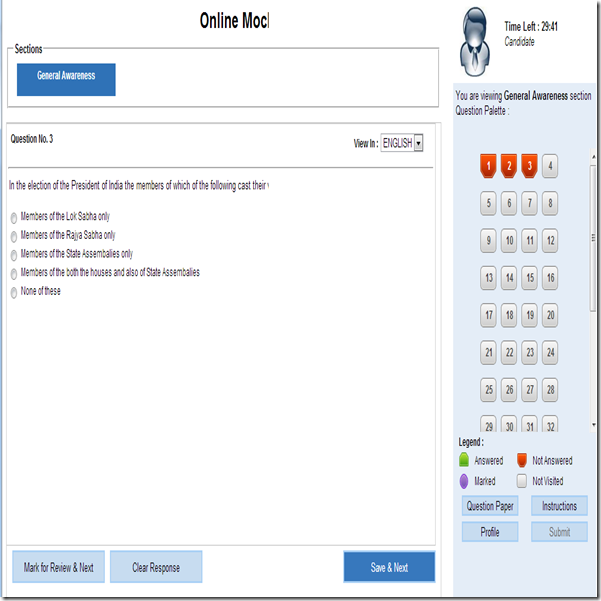 * You will be able to give and see both English / Hindi version of question and there Will one one question at a time. * The total number of 200 questions with time limit of 120 minutes with each question with 5 options. Green: Shows the question been answered. The Red: Shows visited but not answered. The White: Shows neither visited nor answered. The Violet: Question put under ''Mark for Review'' option. * Please note that you cannot use the keyword buttons once the exam has stared. *Finally after 120 minutes you have to submit the rough paper to IBPS inviginators. In order to get the best result browse the paper, this will helps you to get overall review about the questions. Firstly give answers to all the questions which are easy or familiar to you as the exam have negative marking so, be careful while answering. Invigilator will verify and collect your IBPS admit card at the exam centre. A separate computer with some sort of a login window on the desktop screen. The rough paper for doing calculations will be provided. Do comment below to just in case you have any doubt, we would he happy to help you wile preparation for your upcoming IBPS exam.